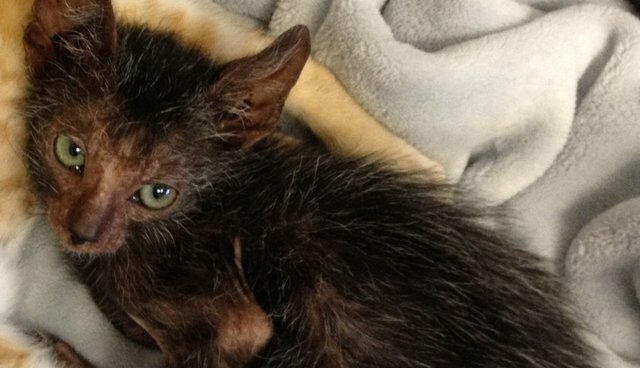 World, meet Eyona - not only one of the most unique-looking kittens on the planet, but also quite possibly the rarest. Eyona was discovered last March by volunteers from TEARS Animal Rescue, in South Africa. While coming to the aid of a stray tabby cat and her litter of six kittens born in a bush inside a Cape Town park, they discovered one of the babies was not at all like the others. 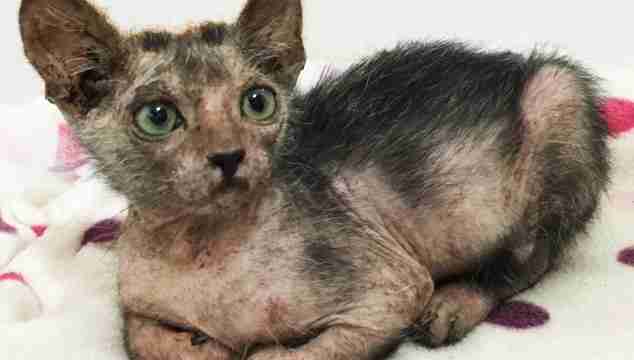 Although his mother and five siblings were all normal kitties, Eyona looked almost like a different creature entirely. His dark hair is patchy and flecked with grey, but he tested negative for various skin diseases. His face is narrow with an intense sort of gaze, reminiscent of another kind of animal. 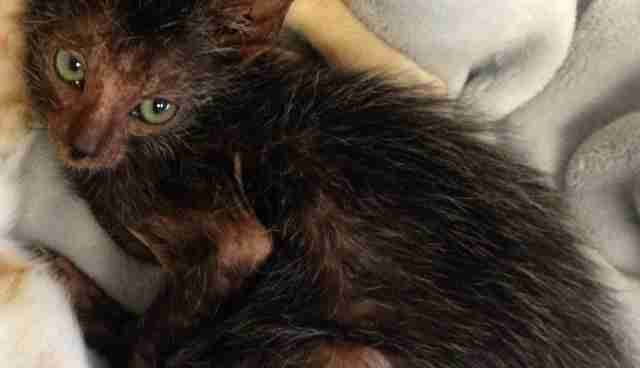 "He's got the look of a wolf, but the physique of a cat," TEARS operations manager Mandy Store told The Dodo. "We thought he might be a sphinx crossbreed, but he's got a lot of little physical differences from cats. He's quite incredible." It wasn't until recently, however, that Eyona's rescuers learned just how incredible he really is. 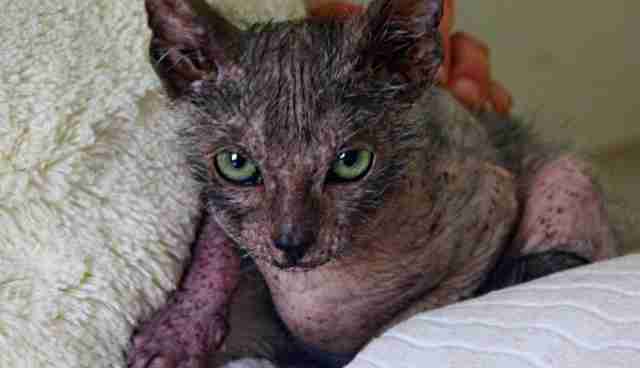 Turns out, Eyona was born with an extremely rare mutation which makes him a different kind of cat - a newly recognized breed called Lykoi, or "Werewolf" cats. TEARS consulted veterinarian Dr. Johnny Gobble, who specializes in this breed. He confirmed that little Eyona represents the 35th known natural occurrence of this mutation worldwide. 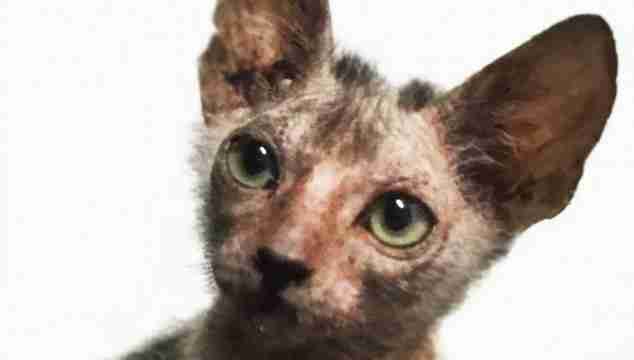 Since 2010, after the mutation was first identified, Lykoi cats have been bred to produce more Lykoi kittens, but what makes Eyona so special is that it's apparently not something he inherited. Eyona's physical appearance is certainly striking, and increasingly so as his hair becomes thinner with time, but it's not the only thing that makes him distinct. Along with looking a bit like canines, Lykoi cats tend to behave more like them too - and Eyona is no exception. "He's very much like a dog," said Store. "He's playful like a dog. He'll look you in the eyes with a sense of great attachment, unlike most feral cats. He'll even drag his blanket around with him. It's like he doesn't know how to be a kitty." Being such a rare kitten, Eyona could probably fetch a lot of money if he were sold to a breeder - but his rescuers have no plans to give him anything other than a happy life as a cherished pet. "Everybody wants to meet him, and everyone wants to buy him. But that's not what we want," Store said. "The last thing we ever want is for him to be exploited. We have the responsibility to makes sure he has a normal life so he can be who he is." That's why, rather than adopt Eyona out to just anyone, TEARS have paired him with a trusted foster mom in a loving home where he'll get the lifetime of love all cats deserve.